As a sales specialist in my department (millwork – doors, windows, moldings, and custom components) the company established sales quotas by some unknown and obviously esoteric formula. Those sales quotas were both general and specific. In general they set an overall number of total sales expected for the month. In specific they established targets for component sales, installations, and custom orders. The first time it happened I chalked it up by reasoning that he must be really busy. Here’s why I thought that. The sales manager would walk down the main aisle and enter each department at the same quickstep pace, just short of a run. Then he would pass behind the desk and, without slowing his pace, he would drop off three sheets of paper on which were the sales quotas for each salesperson in the department. Often, he said absolutely nothing, just dropped off the papers and kept moving. Once in a while he would mumble something like “here are the sales numbers for the month.” But he never paused, never said more, always fled the scene. That’s why he got the first label I gave him – Drive By Shooter. 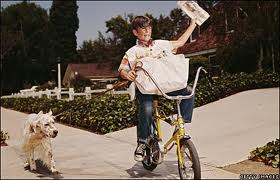 In my more generous moments I simply called him the paper boy because of the way he tossed the papers onto the desk. Can you surmise what I did with my copy? “People are motivated by the targets they are measured against. These targets need to be collaboratively arrived at, unambiguous, transparent, and engender trust by being safe from gaming. So, let me list out the criteria by which effective goals, whether they be sales quotas or production numbers establish and maintain their effectiveness. Never let it be thought they the numbers are anything less than valuable. I was discussing the reported rankings that the store I worked for distributed monthly. They took the overall tally of sales made by sales specialists and compared them to those in other stores. Now there were issues with the numbers that intelligent and aware sales people saw through. Some big numbers came from sales people is very large stores that commanded a very large share of the market so obviously sales people in big stores had a leg up on those in small stores. Second, the numbers were raw numbers which tallied total sales dollars and did not factor in returns or mistakes (some rookie sales people would order the wrong thing, often several thousand dollars’ worth of the wrong things but they had “high” sales numbers.) For the intelligent and aware sales people, the numbers began to lose their luster when they realized this. But the worst revelation when the General manager of the store revealed that the list were largely vanity and held no real value. It was but a device used to massage the egos of sales people so they would feel good be more comfortable in their jobs. Now, this may indeed be enough for some and if so, more power to them. I found it highly insulting that I could be bought with such flimsy window dressing. Once the vanity aspect of your sales numbers or quotas is made known, they hold no value at all, at least they didn’t for me. So, if they are anything less than valuable, don’t bother with them. They work best when they are mutual. They work worse when they are mandates. Collaboration is the key. Engage your associates in the process, give them access to your thinking, to the reasons behind the numbers. In the store I worked at neither the sales manager nor the store manager set the sales numbers. They were set by someone working in a cubicle at the headquarters who, in almost 1oo% probability, had never spent even ten minutes as a sales person on a real sales floor. So, instead of throwing your list onto a desk where they sooner or later (in my case sooner) ended up in the trash, either don’t pass them out at all or take as much time as it takes to discuss the desired response to them. If they are collaboratively arrived at, they are better received and more likely to be met. There must be some payoff for reaching them and it should be personal and relevant. Get up from behind your desk, walk over to where the person works, look them right in the eye, and tell them they have done a great job. Do not, DO NOT, merely send congratulations for numbers met or exceeded in an email! Do not even once send congrats in a general email to all associates without having spoken it personally and directly to the deserving person first. If they work somewhere else, at the very least call them. Pay attention to your producers and they will produce even more. Neglect them and they will wander. Remember that man shall no live by numbers alone. Leave the “What have you done for me today?” approach to divas. Never use it on successful associates who regularly demonstrate the ability to accomplish objectives. One associate at my store had a fabulous week selling well above the quota. On Friday, the end of the fiscal week, the phone rang at her desk. On the line was the general manager and, as she told me, she expected him to congratulate her on a great week. Instead, he made no mention of her success. No mention at all. Instead, he said, “I see in the computer that you have about $6000 in outstanding estimates. Give those people a call and see if you can’t bring that end today. Thanks.” Then he hung up. She confessed to me she was deeply disappointed. He bungled an opportunity to score points, solidify his relationship with a top-producing sale associate, and add spark to the fire. I am confident that if he had called to congratulate instead of pointing out the obvious, she would have tried to close the sales on those outstanding estimates anyway. How do I know that? Because of her track record as a top performer. Too many leaders and managers do themselves damage by forgetting that those who produce will produce more if given the right acknowledgement. That manager either didn’t know this (forgivable but not for long) or he knew it and did what he did anyway (not forgivable and the mark of an amateur in over his head). Never game the system. If you promise something, don’t game it. You game the system when you use technicalities and loopholes to weasel out of keeping promises, of rewarding behavior, of doing the right thing. The other sales specialist in my department was a former employee of another large home improvement store. At that store he was the department manager over building supplies and lumber. As the end of the fiscal year drew near, the general manager revealed that the annual bonuses were not going to be paid because the store had failed to reach its projected sales goals and then asked everyone if they could help find a way to put them over the top. My friend called one of his contractor buddies, a man who regularly bought large quantities of building materials and sent them to a development project in Central America. The contractor came in and made a very large order which put the store beyond its projected numbers and triggered a bonus…for everyone except my friend who had made it possible. It seems that in order to be eligible one had to be a regular employee for a certain number of days and my friend fell short by two days. TWO DAYS! “Sorry,” the general manager said, there’s nothing I can do, but maybe next year you’ll make it.” My friend quit the same day. He discovered that the managers of that company could and would game their system to their advantage. So, remember that the people who work for you and with you are not machines. They think and feel. Don’t screw around with them. If they perform well, move hell and high water to make sure their effort is recognized and rewarded. And no, an “Employee of the Month” award is not enough. Give them the money! Ok, there you are. Don’t sabotage your own efforts by thinking numbers on page will do for you what fair treatment and kind words will. You need numbers and numbers will reveal a good deal, but they will not and they cannot fuel the engine of productivity by themselves. Motivators that don’t motivate – 5 Ways to kill the engine of ambition and progress in your associates and make yourself look completely inept.